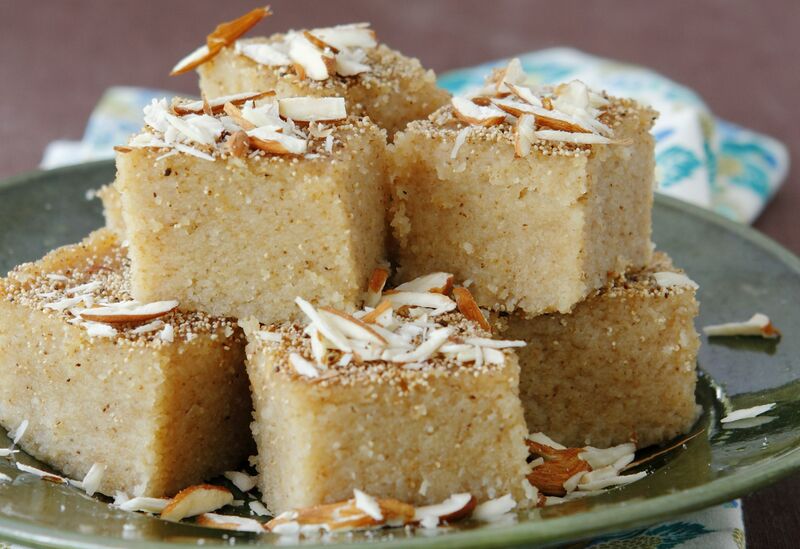 Sanwin Makin is a Burmese dessert with Indian influences. Roast semolina in a wok over low heat until lightly browned. In a saucepan, combine the semolina, coconut milk, butter, sugar, and salt, and bring to boil, stirring continuously. Cook further over medium heat until mixture comes away from the side of the pan. Transfer mixture to a lightly oiled baking tray and smooth out the surface with the back of a greased spoon, or spatula. Sprinkle poppy seeds on the surface. Broil or grill the surface of the cake in the oven until golden brown. Let the cake cool, then cut and serve at room temperature, sprinkled with some toasted almond nibs, if desired.